It really wouldn't be a dinner party if I didn't, at some point during my prep, fill my kitchen with billowy, messy, rancid smoke. It always happen, generally due to my aversion to using my underpowered yet high-pitched kitchen fan and searing things at high heat. This was another recipe pilfered from the epicurious.com archives, and I also changed it up a bit. The original called for un-crispy prosciutto, but I'm not a big fan of the raw-meat texture, so I decided to crispify it. And hence filled my kitchen (and most of my house) with smoke. 2. On a baking sheet toast pine nuts until golden, about 5 minutes (note to the wary - this is another great way to fill your house with smoke - the pinenuts at the edge toast a lot faster and have a rather annoying propensity to burn), and cool. 3. In a blender purée basil with oil until basil is minced. Pour purée through a very fine sieve into a bowl, pressing hard on solids, and discard solids. 4. Heat an oiled pan over medium high heat. 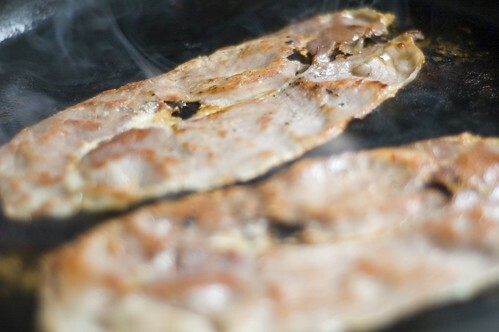 Sear prosciutto on both sides until it is slightly crispy and not too burnt. Cut into matchstick-size pieces. Don't be fooled by the pic - that's NOT steam. It's smoke. 5. Halve and seed cantaloupe. 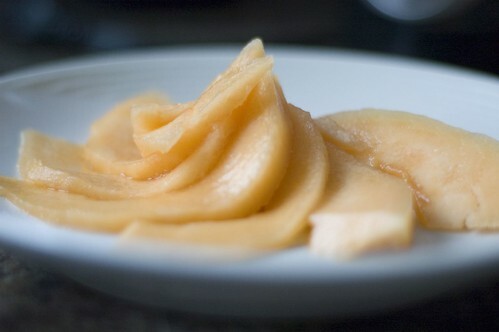 Cut melon into 1/4-inch-thick wedges and discard rind. 5. Arrange melon decoratively on a plate. 6. Top with prosciutto. 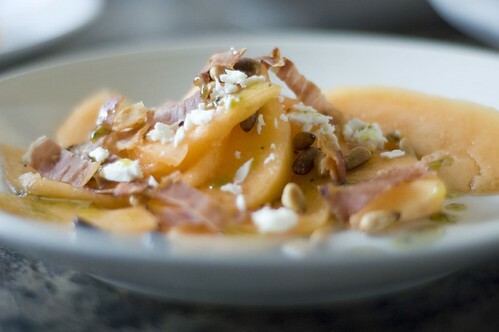 Sprinkle melon and prosciutto with pine nuts and cheese. Drizzle basil oil over top. yum, that looks great. I have always love antipasto plates when you get canteloupe sliced wrapped with proscuitto. I find that trying to take pictures while cooking often ends up in burnt sauces, ruined dishes, etc....But your final dish looks wonderful! This sounds really tasty and the photos look amazing.